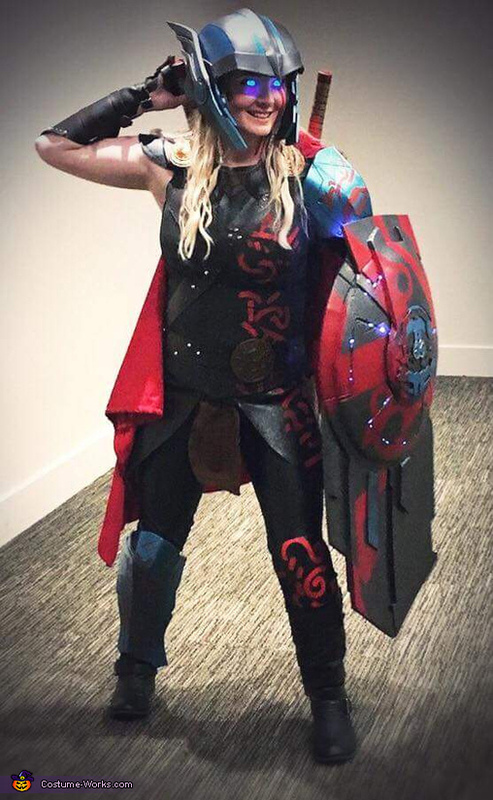 My costume was inspired by Thor Ragnarok, from the fight scene with the Hulk. I build this costume out of foam, leather, and about 150 hours of labor. Everything is completely created by me, nothing has been store bought, except the shoes. The swords, vest, shield, helmet and armor, were all crafted out of foam. The hip panels, arm gauntlets, and pants are leather. I added LED lights to the shield and arm gauntlets that light up to simulate lightning. I also installed LED blacklights in the helmet, and have blacklight sensitive contacts in to simulate that lightning eyes that Thor has when he goes full God of Thunder in the scene. The eye effects in these photos are not photoshopped, and this effect is just as awesome and amazing looking in real life. I decided to build this costume because I love Thor, and was looking for a way to incorporate lights and effects into the costume. My instagram, Missxboof, has more documented photos and videos of the process of building this!